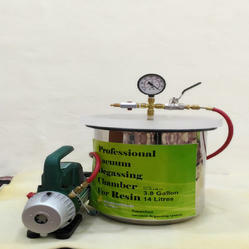 Leading Exporter of vacuum chamber for testing, degassing chamber for resin, resin degassing vacuum chamber, vacuum chamber degassing silicone, vacuum chamber kit and vacuum degassing chamber diy from Chennai. We are engaged in offering of Vacuum Chamber for Testing made up of stainless steel is used to manufacture the chamber and helium leak tests are conducted on these chambers for quality assurance. 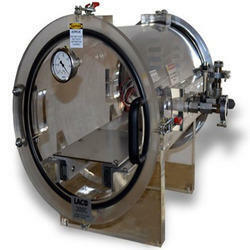 These chambers include three ports, two ball valves, vacuum gauge, and a hinged lid. Vacuum degassing is the process of using vacuum to remove gases from compounds which become entrapped in the mixture when mixing the components. To assure a bubble-free mold when mixing resin and silicone rubbers and slower-setting harder resins, a vacuum chamber is required. A small vacuum chamber is needed to eliminate air bubbles for materials prior to their setting. The process is fairly straightforward. The casting or moulding material is mixed according to the manufacturers directions. -Stainless steel chamber for long-term air-tightness performance. -Burhani Vacuum chamber has a rounded edge at the top, for the protection of silicone gasket. -Vacuum gauge is assembled on a separate port, so that the reading remains accurate even while pumping/venting the chamber. --Gauge reading in both in Hg and Mpa. -Two-sided flippable vacuum gasket for better durability and reliability. 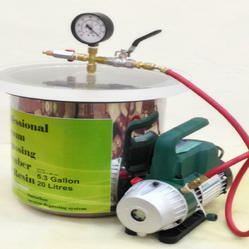 -The gasket is chemically resistant to butane and other solvents. - 25 mm thickness Acrylic lid for long life and clear visibility. -Strong elastic food grade silicone vacuum hose can connect/disconnect easily with the pump/chamber. -50um air filter on the vent valve to reduce air flow and prevent any dust/powder flowing into the chamber. 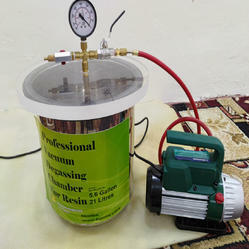 -Easy to install and low-cost to maintain the chamber can be assembled in 5 minutes. -45 day complimentary warranty and life-long parts support. *Lid Acrylic Vacuum Gasket silicone, resistant to Butane and other solvents. *Vacuum Gauge Assembly 0.5 inHg accuracy. *Vacuum Hose 3.3' / 1 meter food grade collapse-proof silicone hose, 3mm wall thickness (8mm I.D, 14mm O.D). *Vacuum Pump Adapter 3/8" hose barb to 1/4 SAE flare port. 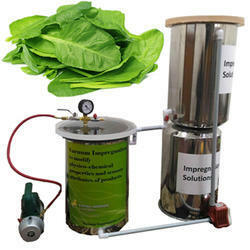 Vacuum impregnation is a non-destructive method of introducing a solution with a specific composition to the porous matrices of fruit and vegetables. Mass transfer in this process is a result of mechanically induced differences in pressure. Vacuum impregnation makes it possible to fill large volumes of intercellular spaces in tissues of fruit and vegetables, thus modifying physico-chemical properties and sensory attributes of products. This method may be used, e.g., to reduce pH and water activity of the product, change its thermal properties, improve texture, color, taste and aroma. Additionally, bioactive compounds may be introduced together with impregnating solutions, thus improving health-promoting properties of the product or facilitating production of functional food. vacuum impregnation may be employed for as a technique for the application of edible film and coating, in order to produce functional food using physiologically active raw materials. Production of novel functional food with the application of vacuum impregnation facilitates the introduction of e.g., probiotics, vitamins, biologically active compounds and minerals to the fruit and vegetable matrix. Literature data mainly concern the kinetics of matrix fortification, potential use of certain active compounds, interactions between tissue and the introduced compound as well as the effect of additives on the rate of respiration processes and potential protection of products against spoilage. 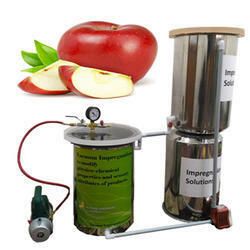 Apple slices cv.Granny Smith Introduced into Vacuum Chamber Hydrodynamic Mechanism (HDM) Vacuum Chamber at – p1=5 KPA Time period t1=10 min sucrose isotonic solutions with an addition of calcium lactate (44.2g/L) or ferrous gluconate (1.13 g/L) Deformation Relaxation Phenomenon(DRP) Vacuum Chamber at atmospheric pressure Time period t2=10 min after vacuum impregnation: fruits enriched with Ca2+ and Fe2+ ions respectively. 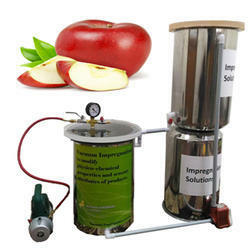 Vacuum impregnation is a non-destructive method of introducing a solution witha specific composition to the porous matrices of fruit and vegetables. Mass transfer in thisprocess is a result of mechanically induced differences in pressure. 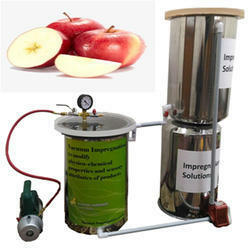 Vacuum impregnationmakes it possible to fill large volumes of intercellular spaces in tissues of fruit andvegetables, thus modifying physico-chemical properties and sensory attributes of products.This method may be used, e.g., to reduce pH and water activity of the product, changeits thermal properties, improve texture, color, taste and aroma. Additionally, bioactivecompounds may be introduced together with impregnating solutions, thus improvinghealth-promoting properties of the product or facilitating production of functional food. Mushrooms cut in half Introduced into Vacuum Chamber Hydrodynamic Mechanism (HDM) Vacuum Chamber at – 20 and 40 KPA Time – 5 minutes Lactic Acid Solution (ph3.05) is pumped into vacuum Chamber Deformation Relaxation Phenomenon(DRP) Vacuum Chamber at atmospheric pressureTime – t2 20, 40, 60, 120, 240, 300, 360 and 720 min Increase of the acidification degree in mushroom. fresh-cut applescv. 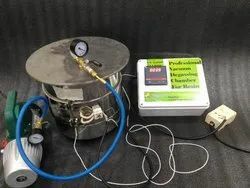 Fuji Introduced into Vacuum Chamber Hydrodynamic Mechanism (HDM) Vacuum Chamber at – p1=13.3 KPA Time period t1=15 min 20% diluted high fructose corn syrup (HFCS) or 1% calcium caseinate (CC) aqueous solution with an addition of 0.4% α tocopherol acetate, 7.5% Gluconal Cal® (GC), and 0.04% zinc lactate (ZL) Deformation Relaxation Phenomenon(DRP) Vacuum Chamber at atmospheric pressure Time period t2=30 min In 100 g fresh-cut apples the vitamin E content increased more than 100 times, and calcium and zinc contents increased about 20 times compared with unfortified apples. 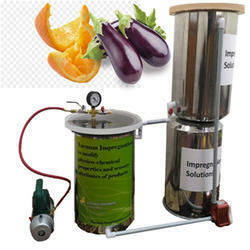 Eggplant fruits and orange peel Introduced into Vacuum ChamberHydrodynamic Mechanism (HDM) Vacuum Chamber at – p1=5KPA Time period t1=15 min isotonic solution of sucrose, iron gluconate and calcium lactate Deformation Relaxation Phenomenon(DRP) Vacuum Chamber at atmospheric pressure Time period t2=15 min a mathematical model to determine the concentration of active components in impregnation solution was established in order to formulate functional food with different calcium and iron salts levelsa. 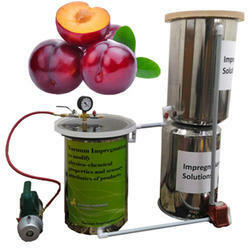 Vacuum impregnation is a non-destructive method of introducing a solution with a specific composition to the porous matrices of fruit and vegetables. Mass transfer in this process is a result of mechanically induced differences in pressure. Vacuum impregnation makes it possible to fill large volumes of intercellular spaces in tissues of fruit and vegetables, thus modifying physico-chemical properties and sensory attributes of products. This method may be used, e.g., to reduce pH and water activity of the product, change its thermal properties, improve texture, color, taste and aroma. Additionally, bioactivecompounds may be introduced together with impregnating solutions, thus improving health-promoting properties of the product or facilitating production of functional food. 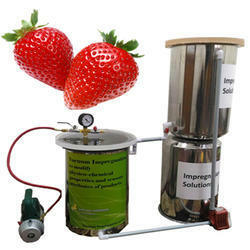 strawberry Hydrodynamic Mechanism (HDM) Vacuum Chamber at p1= 86 kPa Time t1= 5 minutes 12 g/100 g trehalose solution; 0.2 g/100 g solution unpasteurized cold acclimated winter wheat grass extract as a source of AFP and 12 g/100 g trehalose and 0.2 g/100 g unpasteurized cold acclimated winter wheat grass extract Deformation Relaxation Phenomenon(DRP)Vacuum Chamber at atmospheric pressure improvement of freezing tolerance of strawberry. 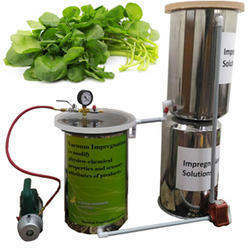 watercress (leaves were selected diameter 1.4 cm) Hydrodynamic Mechanism (HDM) Vacuum Chamber at p1= 51, 58, 68, 85 and 101 kPa Time t1= 5 minutes winter flounder antifreeze protein type I solution (1 mg/100 mL AFP-I ultra pure water) Deformation Relaxation Phenomenon(DRP)Vacuum Chamber at atmospheric pressure smaller ice crystals in AFP-I impregnated (58 kPa, for 5 min) frozen samples. Fresh-cut apple cv. Granny Smith (wedges, each ca. 10 g) Introduced into Vacuum Chamber Hydrodynamic Mechanism (HDM) Vacuum Chamber at = 70 KPA Time 1(t1) = 10 minutes 50% (v/v) Mexican or 50% (v/v) Argentinean honeys, distilled water (control sample) Deformation Relaxation Phenomenon(DRP) Vacuum Chamber at atmospheric pressure Time 2(t2)= 10 minutes Result : less acceptable in terms of sensory qualities than their fresh-cut counterparts, total polyphenol content and antioxidant activity values in vacuum impregnated products were lower than in fresh-cut samples. zucchini (slices 0.5-cm thick) Hydrodynamic Mechanism (HDM) Vacuum Chamber at – 2.5 kPa Time t1= 10 minutes product:solution ratio of 1:3.3; maltodextrine solution (7.5%–9%, 10%), NaCl (0%–5%) and CaCl2 (0–1000 mM) Deformation Relaxation Phenomenon(DRP) Vacuum Chamber at atmospheric pressure Time t2= 30 minutes improvement of solute and water gain and limitation of textural and microstructural changes. 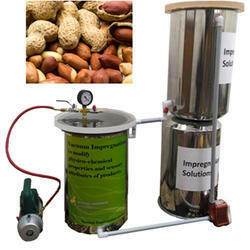 Heated Vacuum degassing is the process of using vacuum to remove gases from compounds which become entrapped in the mixture when mixing the components. To assure a bubble-free mold when mixing resin and silicone rubbers and slower-setting harder resins, a vacuum chamber is required. 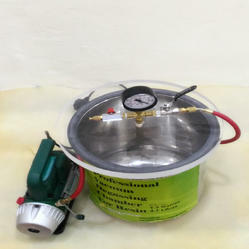 A small vacuum chamber is needed to eliminate air bubbles for materials prior to their setting. The process is fairly straightforward. The casting or moulding material is mixed according to the manufacturers directions. Looking for “Vacuum Chamber for Testing”?